To judge from the weekend roundups compiled here, there is always something interesting being discovered or announced. The difficulty can be that there is too much, and it becomes challenging to recall what is most important out of the constant barrage. The list below comes from stories noted in the weekend roundups. Some of the artifacts were discovered in previous years, but only announced in 2018. For each item, I suggest a reason for its significance. I don’t deny a bias towards objects and sites more closely related to the Bible. 1. A copper alloy ring bearing the inscription “of Pilatus” may have belonged to an administrator who served Pontius Pilate. Though excavated at the Herodium many years ago, its significance was only recently discovered. Why is this in my top 10? Artifacts with names of biblical figures are relatively rare, and Pilate played a major role in the crucifixion of Jesus. 2. A seal impression that belonged to a man named Isaiah was discovered in Jerusalem. Why is this in my top 10? Though there’s good reason to doubt that this is the prophet by the same name, we still have the convergence of name (Isaiah), city (Jerusalem), and date (8th century BC). 3. A glazed ceramic head from Tel Abel Beth Maacah that dates to the 9th century BC may depict a royal official. Why is this in my top 10? I’m less convinced by the claim that this depicts an Israelite king than I am by the quality of this colorful work of art. That’s rare enough among the Israelites that you don’t need a royal connection to argue for its significance. 4. Excavations of Kiriath Jearim revealed a large platform that is 110 by 150 meters in size, with walls preserved 6 to 7 m high. Why is this in my top 10? You don’t have to believe the archaeologist’s wild theories to recognize that this is a major building project at a site we knew almost nothing about. 5. An undisturbed Canaanite tomb from the 17th century BC was discovered at Megiddo. Why is this in my top 10? I’m a sucker for undisturbed tombs, and it doesn’t hurt that this one was next to the royal palace. 6. The Galilean synagogue at Huqoq continues to produce beautiful, biblical mosaics, including a scene of the Israelite spies, a youth leading an animal, and a fragmentary Hebrew inscription reading “Amen selah.” Why is this in my top 10? I’m a big fan of ancient depictions of biblical scenes, as you might have guessed from my dream to create the Photo Companion to the Bible. 7. More than 1,000 Hellenistic-era seal impressions were discovered in excavations at Maresha. Why is this in my top 10? For a country that has so relatively few inscriptions preserved, this is an enormous trove that will bear fruitful study for many years to come. 8. An inscription at a site on Israel’s coast provides evidence for Babylonians living in Samaria after the fall of Jerusalem. Why is this in my top 10? This discovery helps to fill in details for an all-too-elusive period in the historical and archaeological record. 9. Excavations of Ein Hanya uncovered an Israelite royal capital (proto-Aeolic? ), a 4th century Greek drachma, and a Byzantine pool system. Why is this in my top 10? Israelite royal capitals stir the imagination, and Ein Hanya has been off everyone’s radar until now. 10. Archaeologists discovered a 5th-Dynasty tomb in Saqqara, Egypt, that has never been looted. Why is this in my top 10? Top 10 lists need 10 items. Besides, the photos are impressive. Others have created their own top ten lists, including Gordon Govier (Christianity Today), Bryan Windle, Christopher Eames, Ruth Schuster #1 and #2 (Haaretz), Amanda Borschel-Dan (Times of Israel), and J-P Mauro (Aleteia). The Epoch Times’s list covers the world. Those we lost in 2018 include Philip Davies, Gary Knoppers, Jack P. Lewis, John McRay, Richard Rigsby, Ephraim Stern, James F. Strange, and Ada Yardeni. New releases from BiblePlaces.com this year were Ruth, Psalm 23, and Persia. Get all three volumes at a discount. A 2,000-year-old bronze ring with a solitaire gemstone was uncovered in the City of David National Park in Jerusalem. Ceramic jars and cooking pots suggest the Persian Empire used Tel Keisan, near the city of Akko in Northern Israel, as a base camp in their effort to conquer Egypt (Haaretz premium). Police caught antiquities thieves in the act of excavating Huqoq for ancient coins. The petrified remains of a harnessed horse has been uncovered in Pompeii. Emma Maayan-Fanar writes about her recent study at Shivta which revealed a painting of Jesus. Longer, hotter summers and drier winters are a threat to the remaining cedar trees in Lebanon. The NY Times reports on the only tourist boat operation on the Dead Sea. Several people are dead and a dozen injured after a bomb blast struck a tourist bus near the Egyptian pyramids in Giza. “Finds Gone Astray” is a new exhibit opening on Monday at the Bible Lands Museum. The Times of Israel provides some of the background for these artifacts that have been recovered from thieves and smugglers in the West Bank since 1967. Carl Rasmussen asks: Herod or Jesus: Which “King” Has Had the Most Lasting Influence? What is the Samaritan Torah? David Moster has created a 10-minute video to answer that question. National Geographic has produced a 4-minute animated video on The History of the Bible. Gary Knoppers died last week. The Ultra-Orthodox are upset that the French government won’t allow entrance into the Tomb of the Kings in Jerusalem. The French claim that they have renovated the site and with the right assurances, they will open it to the public. A long tunnel has been covertly dug underneath the “Tomb of David” on Mount Zion and now some people are mad. The large number of tourists visiting the Church of the Nativity in Bethlehem has led to the development of an app that will handle reservations. Three ancient cities in Crete are the focus of an exhibit at the Museum of Cycladic Art in Athens, Greece. Harvey Mudd College is giving its Cypriot artifacts to the University of Cyprus. Don McNeeley shares a report on the 2018 annual meeting of the Near East Archaeological Society. You can join the society here. The video is now online for the 2018 Plenary Address for the ASOR Annual Meeting: “Between Looters, Private Collectors, and Warlords: Does Archaeology Stand a Chance?” by Hélène Sader, Professor of Archaeology, American University of Beirut. Tali Erickson-Gini is on The Book and the Spade talking about the Timna Park excavations and the opportunity for the public to volunteer. Wayne Stiles compares Peter’s boast in the Upper Room to his failure in the Garden of Gethsemane to find application today. That “ark of the covenant” in the church in Ethiopia—it’s a replica. Rick Lanser believes he has evidence that supports the birth of Jesus on Nisan 1, 6 BC. Ferrell Jenkins’s favorite photos this week include Hasankef, the Roman road near Saglikli, and Riblah. Justin Taylor interviews the filmmaker who has created “The Chosen,” the first-ever multi-season drama about the life of Christ. Archaeologists disagree on whether the highway running over Tel Beth Shemesh should be expanded or not. That was the plan when a salvage dig was initiated several years ago, but now one of the responsible archaeologists claims that the site must be preserved at all costs. Yesterday’s article in Haaretz magazine (premium) walks through the politics of the decision. From those interested in the archaeological results, the main discovery is that Judahites returned to living at the site soon after the Assyrian destruction in 701 BC. This contradicts the theory of some that there was a long occupation gap, possibly the result of an Assyrian policy forbidding resettlement. Whether or not such a finding justifies building a tunnel, overpass, or alternate route is the point of dispute. Several years ago, I checked out a book at the library to read to my kids. 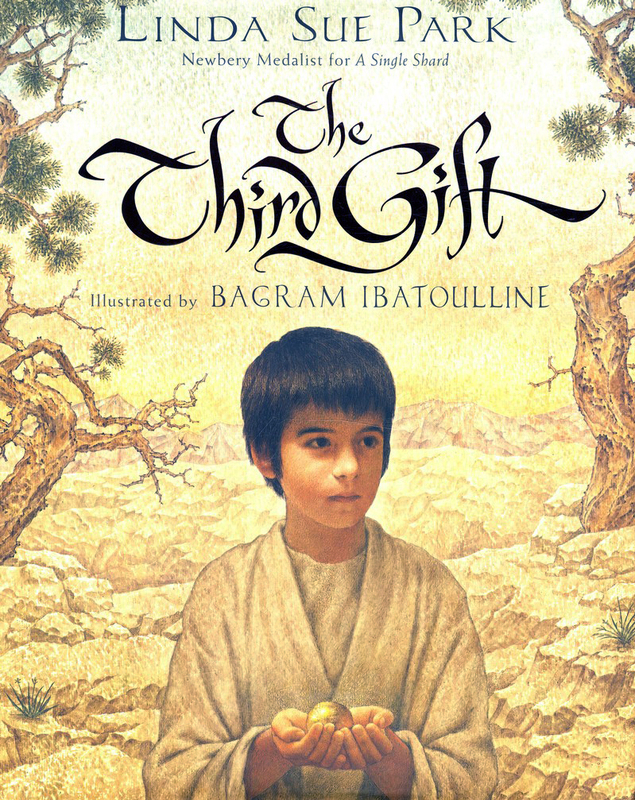 It turned out to be a delightful story of a young boy who helps his father harvest resin from trees in Arabia. The connection with Jesus’ birth is sort of a surprise twist at the end of the book, so if you read it to your kids, be sure not to give away that this is a Christmas story—they will get it by the time they reach the last page. The book is entitled, The Third Gift, by Linda Sue Park (Boston: Clarion, 2011). 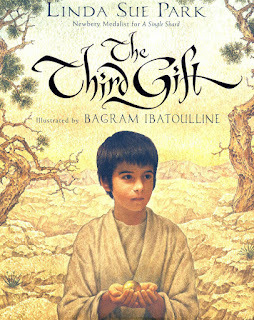 The Third Gift was probably intended for ages 4-10 (best guess with input from my kids), but the beautiful illustrations (by Bagram Ibatoulline) and the Middle Eastern setting made it interesting for me as well, and it gives you a different perspective for thinking about a very familiar account from the book of Matthew. The “Author’s Note” on the last two pages summarizes the history of our modern perceptions about the biblical story, and re-connects the event with its original geographical and cultural setting. Recommended if you have young ones around for the holidays. Archaeologists have discovered a 5th-Dynasty tomb in Saqqara, Egypt, that has never been looted. Excavations begin today. The photos are impressive. A 4,500-year-old marble pillar that sat in the basement of the British Museum for 150 years has been revealed as the first recorded account of a conflict over a disputed border — and the earliest known instance of word play. The pillar is featured in an exhibit entitled, "No Man's Land," that runs through January. The use of machine translation may open the door to deciphering more than half a million cuneiform tablets from Mesopotamia. The Syrian Director General of Museums and Antiquities claims that the US is looting ancient tombs in northern Syria. The November issue of the Newsletter of the Egyptian Ministry of Antiquities features stories on the latest archaeological discoveries, the transfer of antiquities to the new Grand Egyptian Museum, and cultural events. All past issues of the “Archaeology in Jordan” Newsletter are now available online. The 2018 issue is also available here. The new issue of Biblical Archaeology Review includes stories on the destruction of Azekah, an artificial tell in Arkansas, and excavation opportunities in 2019. Students from all over the world, including Arab countries, have joined Aren Maeir’s MOOC on biblical archaeology. The Institute of Biblical Culture will be offering two classes in January: Biblical Geography I and Early Biblical Interpreters I. They are also running a buy two, get one free special. David Moster shares his experience at this year’s SBL conference with a 10-minute video. The first in Ferrell’s Favorite Fotos series is of Babylon, taken in 1970. Archaeologists believe that a public bath excavated in Sepphoris may have been used by Rabbi Judah the Prince. Archaeologists excavating at the Negev town of Shivta have found a lamp wick dating to the Byzantine period. A total of 1,500 landmines have been cleared since the spring near the Jordan River baptismal location of Qasr al-Yahud. Migdal Aphek, the Crusader castle also known as Mirabel, will soon be open to the public following conservation works. The Annual Conference on the Excavations of the Institute of Archaeology at the Hebrew University will be held on Thursday. Israel’s Good Name reports on a university field trip to the Hebron area. Biblical Byways has a couple of tours to Israel coming up, including a Spanish tour in April. Tim Frank’s latest book, Household Food Storage in Ancient Israel and Judah, is now available in paperback and as an e-book. The Lexham Geographic Commentary on the Gospels was chosen as the Best Book in Biblical Studies in Christianity Today’s 2019 book awards. You can read an excerpt about the birthplace of Jesus here. Some valuable resources became available this year that I thought I might briefly summarize, either as a gift-buying guide or as additions to your own wish list. Let me start with the Lexham Geographic Commentary to the Gospels. Originally released for Logos Bible Software, it is now available in print. The volume is loaded with 48 essays written by people who have lived and breathed biblical geography and archaeology for many years, including Barry Beitzel (editor), Benjamin Foreman, Gordon Franz, J. Carl Laney, Chris McKinny, Elaine Phillips, A.D. Riddle, and Paul Wright. I wrote two of the essays—one on the disciples’ statement about the “magnificent stones and wonderful buildings” of the Temple and the other on the location of the swine dive in the Sea of Galilee. I think that this book should win an award for its unique contribution. It’s on sale now for $25, including free shipping, plus you get the ebook for free. Or Amazon has the print book alone for $27. The ESV Archaeology Study Bible was released earlier this year after many years of research, writing, and production. This up-to-date resource is filled with excellent sidebars and commentary notes. You can see my earlier description here. It’s available now at Amazon for $42. Randall Price and Wayne House wrote the Zondervan Handbook of Biblical Archaeology. I’ve heard that it’s gone through several printings already. I hope to offer a longer review here on the blog in the next few months. My expectation is that it will be very useful to both Bible teachers and students alike. The National Geographic Atlas of the Bible was released in June. I haven’t purchased it yet, but the listing tells me that it is 112 pages long and includes 17 maps. One Amazon reviewer says that the text is written from a minimalist perspective. Filament is a new resource that I saw at a recent conference that combines a print Bible with digital content on your phone or tablet. The printed book has the Bible text only, and the accompanying app provides study notes, photos, and videos. Doug Greenwold at Preserving Bible Times has just released a new book on John 4 entitled Jesus Engages a Samaritan Woman. Shipping is free through the end of the year. Finally, I’d encourage you to consider for yourself or others the newest resources created this year by us at BiblePlaces.com. We have a limited audience and every sale helps us to continue forward with the next project. This year we released Ruth and Psalm 23 in the Photo Companion series ($29 and $24, respectively, or $39 for both). We also created a beautiful photo book entitled Psalm 23: A Photo Commentary, available from Amazon for $20. The latest volume of the Pictorial Library of Bible Lands is Persia, available for two more days at the introductory price of $25. If you shop on Amazon, use the code GIFTBOOK18 to get $5 off a $20 book order through 12/21. Peter Feinman summarizes some papers on the subject of the 10th century BC given at the recent ASOR conference. Andrea Nicolotti looks for archaeological evidence for the scourging of Jesus. A well-illustrated BBC feature explains how ISIS’s destruction of a mosque revealed an Assyrian palace. I am very happy that Wipf and Stock has re-published David Dorsey’s The Roads and Highways of Ancient Israel. For too long, you could only find used copies of this excellent resource for $200 and up. Lois Tverberg’s excellent Reading the Bible with Rabbi Jesus is on sale with bigger discounts if you order 2-4 copies. Everything at Eisenbrauns is 30% off with coupon EEOY18. Bible Land Passages has now released 10 episodes that connect the biblical stories to the biblical world, using historical, geographical, and archaeological data. The episodes are available for free online as well as for purchase on DVD. The latest episode is entitled “Khirbet Qeiyafa: Witness to David’s Kingdom.” Episode 11, “The Power of Jesus in Galilee,” will be released next month. In Caesarea, a remarkable Crusader-era cache of 24 gold coins and an earring was found in a small bronze pot, hidden between two stones in the side of a well. The NY Times has a summary of the Pilate ring discovery. Robert Cargill prefers the theory that the ring belonged to one of Pilate’s papyrus-pushing administrators. Ferrell Jenkins shares a number of related photos. Archaeologists working at Timna Park opened their excavation to volunteers from the public for three days during Hanukkah. The second in a series of 12 objects from the Temple Mount Sifting Project is an arrowhead from the 10th century BC. Jim Davila tries to unravel the latest with the Qumran caves with potential Dead Sea Scroll material (with a follow-up here). Matthew Adams gives an update on the Jezreel Valley Regional Project on The Book and the Spade. Israel is on pace to hit a new annual record of 4 million tourists this year. Episode 1 in Wayne Stiles’s excellent “The Promised That Changed the World” is now available. You can sign up to get free access to all three episodes. Dr. Richard Rigsby, longtime professor at Talbot School of Theology, went to be with the Lord this morning. Dr. Rigsby impacted many lives in his pastoring (at Bell Gardens Baptist Church since 1986) and in his teaching (at Talbot from 1974 until his retirement in 2012). His publications are numerous, including, most recently, several articles in the Dictionary of the Old Testament: Pentateuch. My initial meeting with Dr. Rigsby and his wife Donna was through the Talbot Bible Lands program which they began in 1990. Every year, excepting a few when international incidents intervened, Dr. Rigsby and Donna recruited and led a group of seminary students to the Middle East. And they were always large groups, full of highly motivated students who knew of the excellent reputation of the trips. Every week in the fall semester, Dr. Rigsby taught a class preparing students for their geographical, historical, and archaeological studies. And the day after Christmas, every year, they boarded a plane with 45+ students. In the early years, they toured Israel every year. My first experience with Dr. Rigsby was filling in as a guide for Talbot’s Western Wall Tunnel tour in 1993. In 1997, Dr. Rigsby led the first Turkey-Greece-Rome expedition, and henceforth they traveled to Israel in the even years and Turkey-Greece-Rome in the odd years. Many of their students went on both trips; though expensive, the students knew that these trips were well worth the investment in learning the Bible and its world. For a few years, the Rigsbys added a summer trip to the Greek islands, eager to give their students the opportunity to go just about everywhere Paul went. Dr. Rigsby’s impact is vast, and I cannot begin to communicate its scope. I know that the Rigsbys hosted a Talbot Bible Lands reunion in their home every year, and every year former participants would travel sometimes great distances to be there. This was an annual testimony to the enduring impact of the program and the great love they had for the Rigsbys. Dr. Rigsby had a significant influence on me. The most important was in his knowledge of the Word and his love for the Lord. One of his favorite passages was Zechariah 4:6: “Not by might, nor by power, but by my Spirit, says the Lord of hosts.” He lived a wise, humble life by the power of the Spirit. A particular way that Dr. Rigsby’s influence is felt by many reading this reflection is his encouragement to me in developing the photo collections. In fact, I released the very first edition of the Pictorial Library of Bible Lands to the Talbot Bible Lands group in January 2000. I will never forget how strongly he urged me to press on in this work (and how he encouraged his students to purchase the collection, so that I could press on). Several years later, Dr. Rigsby showed me a closet full of old slides taken by Dr. Charles Lee Feinberg, and that was the beginning of a new photo series, the Historic Views of the Holy Land. Dr. Rigsby received the first copy of the first edition of the Pictorial Library, and this summer I drove over to his house to share the newest volume (#19) in the Pictorial Library. Unlike all the rest, these photos were of biblical sites that the well-traveled scholar had not visited. We plugged my computer into his bedroom TV so I could show him my new photos of Susa, Persepolis, the Behistun Inscription, and more. He was tickled by the experience of virtually visiting these significant sites, and his encouragement of me in my work was as strong as ever. Dr. Rigsby also has influenced me and others in the development of Bible lands programs. My first tour of Turkey, Greece, and Rome was with his Talbot Bible Lands trip in 2001. When my university decided to begin a similar study program, I unabashedly copied Dr. Rigsby’s brilliant itinerary in my proposal. That trip, largely unmodified from that original proposal, has been conducted by The Master’s University since 2007. All of our students are thus, unknowingly, in Dr. Rigsby’s debt. Other programs now led by his students are no doubt patterned after his. But no one really could copy his plan. No tour leaders were more organized, no students were better prepared, and no trip was more filled with little “extras,” all along the way. Every day, two people in the group were honored with an artistically creative “paper plate award” that recognized a particular contribution or characteristic. Special services were planned for worship or celebration. Gifts were purchased in advance for the in-country instructors and guides, and no details were overlooked in planning or execution. And, as all of the Talbot Bible Lands students would tell you, no other program had Dr. Rigsby’s incomparable wife Donna. I was blessed to teach with Dr. Rigsby on all but one of his Israel tours since 2000. I never ceased to marvel at how full he made the trips. No group that I ever worked with stayed as long or saw as much. His mindset was that as long as the group was in the Middle East, they might as well visit one more site or travel to one more country. On our next-to-last tour together, in 2010, he decided we would make a side trip to Mount Sinai. The climb to the top, in my opinion, is the hardest of all that tourists regularly do in the Middle East; it is several times harder than the walk up the snake path at Masada. But as always, Dr. Rigsby was at the front. He was about 75 years old at the time, but like Moses, his eye was not dim, nor his vigor abated. Dr. Rigsby and Donna have been like second parents to my wife and me, and like bonus grandparents to our kids. When we passed through California in 2009, they treated us all to a day at Disneyland. Since our move to California, they have warmly welcomed us to their home many times, making us meals and cheering on our children in their piano progress. They have been kind and generous at every turn, and all who know them would heartily agree. Our most recent visit in their home was on Thanksgiving morning. Donna was her usual joyful self, though her husband’s health had recently taken a decline. But I had a new book for Dr. Rigsby, the Lexham Geographic Commentary on the Gospels, and he perked right up as I described some of the essays, a number of them written by his former students. Dr. Rigsby’s time of service is now complete, but his influence will long continue through his family, his church, and his students, along with all of those that they now serve. The Lord has indeed greatly blessed his people through the faithful life of our dear teacher and friend. Authorities have recovered from antiquities thieves a Neolithic stone ritual mask that comes from the Hebron hills. Archaeologists have found evidence for trephination in a Late Bronze tomb at Megiddo (Haaretz premium). Egyptian officials announced that treasures from the tomb of Tutankhamun will tour ten cities in the world prior to the 2020 opening of the Grand Egyptian Museum in Giza. The exhibit is currently in Los Angeles and then heads to Paris. The other cities have not yet been announced. “Inside the Cloak-and-Dagger Search for Sacred Texts” is in this month’s issue of National Geographic. As you would expect, the text is engaging and the photos beautiful. “National Geographic has commissioned leading British indie production company, Caravan to produce The Bible from Space, a two-part documentary special which reveals the truth behind the biggest, most incredible stories from the Old Testament.” You can be sure that any TV production which promises to “reveal the truth” does not. Carl Rasmussen is having second thoughts about the route of Paul’s ship from Chios to Miletus. Luke Chandler is leading a tour of Israel in June, with the option to stay longer and join an archaeological excavation. SourceFlix has released a 4-minute video about Tel Dibon, including footage of an early-morning fly-over. Ferrell Jenkins writes about the same site and provides some nice photographs. A board game dating to the time of Abraham, the Royal Game of Ur, is making a comeback in Iraq. The online Massive Open Online Course (MOOC) entitled “Biblical Archaeology: The Archaeology of Ancient Israel and Judah” begins on Wednesday. The Institute of Biblical Culture is offering your choice of a free class. If you’re not a subscriber to the BiblePlaces Newsletter, you can sign up in a few seconds. We send about three issues a year, with one coming next week.